Key difference: A meteor is the flash of light that follows a piece of interplanetary debris as it enters our atmosphere. Meteor is not the debris itself, but the flash of light caused by the debris. If this debris impacts on the earth it is called a meteorite. A meteor is the flash of light that follows a piece of interplanetary debris as it enters our atmosphere. Meteor is not the debris itself, but the flash of light caused by the debris. 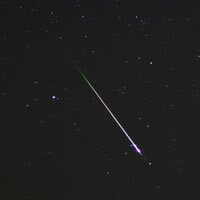 We often refer to meteor as a falling star or shooting star. The meteor, i.e. flash of light, is caused as the debris heats up due to the incandescence by the friction of the atmosphere. Many meteors appearing seconds or minutes apart, and appearing to originate from the same fixed point in the sky, are called a meteor shower. Sometimes the falling debris is an asteroid that has been knocked off course and is pulled in by the earth’s gravitational pull. However, mostly the object is a meteoroid. A meteoroid is any debris in the Solar System. The size of a meteoroid can range from the size of a grain of sand to a boulder sized particle weighing 220 lbs (100 kgs). When these meteoroids enter the earth’s atmosphere they cause a meteor, i.e. a trail of light, which we refer to as a falling or shooting star. Usually, the meteoroid is small enough that it gets burned up in the process. However, if the meteoroid survives and lands on the surface of the Earth, or parts of it do, they are termed as meteorites. A meteorite can be of any size and any weight. 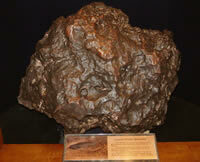 The biggest meteorite found in the United States is the Willamette Meteorite. It is 10 feet (3.05 m) tall by 6.5 feet (1.98 m) wide by 4.25 feet (1.3 m) deep, and weighs about 32,000 pounds (14.5 metric tons). The biggest meteorite found on Earth is the Hoba meteorite, which weighs more than 60 tons. It was found and is still located at the Otjozondjupa Region of Namibia. However, there have also been meteorites found on the surface of the moon and Mars. Hence, a meteorite is any interplanetary debris leftover after a meteoroid enters the atmosphere and has impacted on the surface. Traditionally, meteorites have been divided into three broad categories: stony meteorites, iron meteorites and stony-iron meteorites. Stony meteorites are rocks, mainly composed of silicate minerals, iron meteorites are largely composed of metallic iron-nickel, while stony-iron meteorites contain large amounts of both. However, today meteorites are mainly classified based on their structure, chemical and isotopic composition and mineralogy.